Very peaceful schooling fish that should be kept with at least 10 fishes. It is ideal for a community tank. Do not keep the fish with substantially larger fish such as the Pterophyllum scalare, for the fish may get eaten. The tank should be well-planted on the sides and background and have a dark gravel substrate. The lighting of the aquarium should be dimmed by some floating plants. A regular changing of the water is necessary. The fish is omnivorous. You should give them a great variety of live, frozen and dry food. Because the mouth is not big, the food should be small. Breeding is not easy. The water should be very soft and acidic. (max. 2GH en 6 PH). Up to 130 eggs are laid between bushy plants. After spawning the parents should be removed. The eggs are especially sensitive to light. After 1 day the eggs hatch and another 5 days later the young fishes are swimming free. Then you can feed them with infusoria. 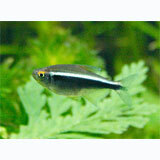 They are best kept in a tank well planted on the sides and back with a dark substrate and background.